–first, prepare for the crust. -prepare a non stick round pan and place a heavy duty almunium foil on a flat surface, and gently fold up the sides of the foil around the pan. Make sure to do this gently so that you don’t create any holes in the foil. and if there’s any holes, water will get into the pan and ruin the crust. Press the foil around the edges of the pan. -preheat the oven to 350f, with rack in lower third oven. – blend the milk crackers in a food processor or blender until finely ground, then put in a large bowl, and stir in the sugar and salt. Melt the butter, and stir in the melted butter. -put the crackers crumb in the bottom of spring pan. (about 1/4), gently press down on the crumbs using your finger/rubber spatula, until the crumbs are nice even layer at a bottom of the pan. Then place in the oven for “10 Minutes”. Remove from the oven and let cool down, then reduce the oven temperature to 325F. -place the creamcheese into a large bowl of an electric mixer, with the paddle attachment. Mix on medium speed until creamy, smooth, and soft. Then add sugar, salt, and vanilla, mix until its blend perfectly. -add the eggs, one at a time. Then add the sour cream, beat until incorporated. Last, add the whipping cream. *note : remember to scrape down the sides of mixer bowl, and scrape up any thicker bits of cream cheese that ve stuck to the bottom of the mixer paddle. -pour the cream cheese over the baked crust, smooth the top with rubber spatula. Place the roasting pan with the springform pan in it, in the oven, on the lower rack. and Carefullu pour the hot water into the roasting pan (without touching the hot oven), to create a water bath for the cheesecake. Bake for 1.5 hours at 325F. -Turn of the heat of the oven, let the cheesecake cooling down. -Place the sour cream in a bowl, stir in the powdered sugar and vanilla until smooth, chill until you’re ready to serve the cake. 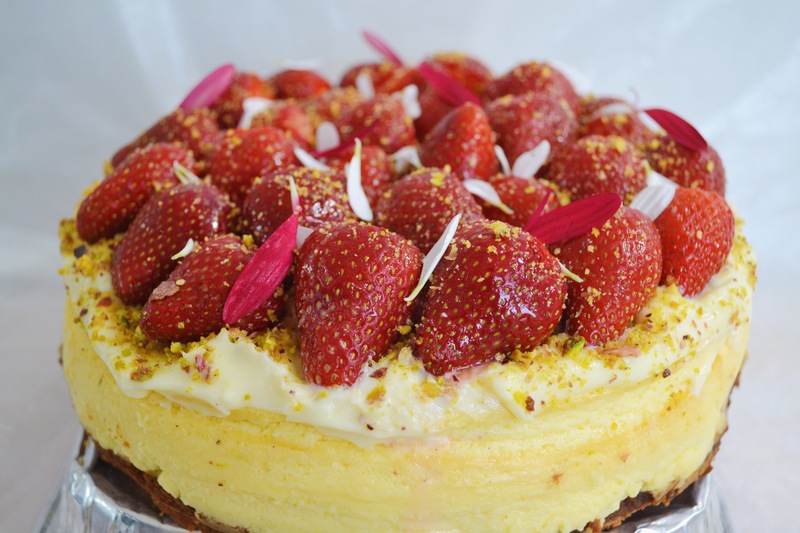 For the topping, i use strawberries and ground roasted pistachio nut. You can also use blueberries, raspberries, and any kind of fruit/nut you wanted.